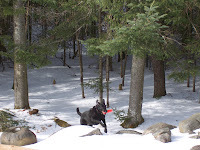 Today's photos are the view from home on an early spring day and an action shot of a dummy with a dummy. 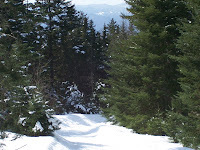 Early Spring in the Adirondacks, like any time in the Adirondacks, is a great time to be outside. This is a great time of year if you are an interested observer of nature and changes. I happen to be an ardent observer. After the long, sleepy winter, it is great to see and feel the world around you wake up. At the risk of sounding sappy, it gives one the feeling of movement and waking up. Oh yes, the sap starts running too. It also seems creatures who live in the Adirondacks get a little wound up this time of year. The birds are twittering and singing like crazy but still hitting the feeders. I guess they have to eat even though their bird-brains are thinking about courtship. Puz, the resident lab is wound tighter than a drum. He is pacing around the house and doing his "in and out dog" routine." "Boof, let me out, "boof, let me in," etc. Every little sound, even imaginary ones, elicit a bark. Since the homestead is located on two plus acres, it is pretty darn quiet, so most of the sounds he barks at are indeed imaginary! This is one of those times when he is a dummy, so I stand on the front porch and play dummy with the dummy. That is, I toss his training dummy and he retrieves it. Truth is, this works for both of us. I enjoy being outside in the relatively warm temperatures and sunshine. This goes on until he is fetched out to exhaustion and I get a few moments of peace. So much for my little overview of early spring at the homestead. By the way, spring skiing is great these days - Whiteface is a blast and Mount Van Hoevenberg still has awesome conditions.